New Cd by Duo Granato, Sax&Piano. Il tuo progetto ci piace e abbiamo deciso di promuoverlo tra «I nostri preferiti»! Nei prossimi giorni apparirà sulla nostra Landing Page e nella categoria «Raccomandati». Una buona ragione per essere fieri e per farlo sapere a tutti: pubblica una notizia, un post o un tweet! This project ended successfully on 11/11/2017 10:00! You will receive a card of the Duo with signature and a personalized dedication. You will receive the new CD and a card of the Duo with signatures and special dedication. You will receive the new CD and the CD Desert Sketches, both signed and with special dedication plus the Card, signed and with dedication. You will receive the new CD plus the Cd Desert Sketches, signed and with dedication. In addition, your name will be featured on the CD booklet. You will receive the new CD plus the Cd Desert Sketches, signed and with dedication, your name will be featured on the CD booklet. In addition, the Duo will come to play a concert where you want. 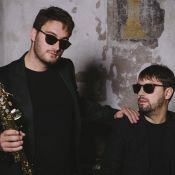 The Duo Granato is an eclectic chamber music group consisting of Cristian Battaglioli (saxophone) and Marco Rinaudo (piano). Together the two artists have been able to approach the chamber music repertoire for saxophone and piano with an accurate research on timbre and sound quality, finding a new balance between the two instruments.